Lately we're hearing announcements the government is makin' money. The Federal Reserve announced they made $77.4 billion in 2011. The Federal Reserve Banks' 2011 net income of $77.4 billion was derived primarily from $83.6 billion in interest income on securities acquired through open market operations (Treasury securities, federal agency and government-sponsored enterprise (GSE) mortgage-backed securities (MBS), and GSE debt securities). Yet the Federal Reserve gave $75.4 billion of that 2011 net income to the U.S. Treasury. Nice magic trick isn't it? Buying U.S. Treasuries from the Treasury and giving money back to the Treasury from the interest? Speaking of the Treasury, they too are makin' money, this time from mortgage backed securities. The U.S. Treasury reported a whopping $25 billion in profits from their portfolio of MBSes or toxic assets acquired during the financial crisis. The Fed dramatically increased their U.S. Treasuries holdings in 2011 by an astounding $683 billion. 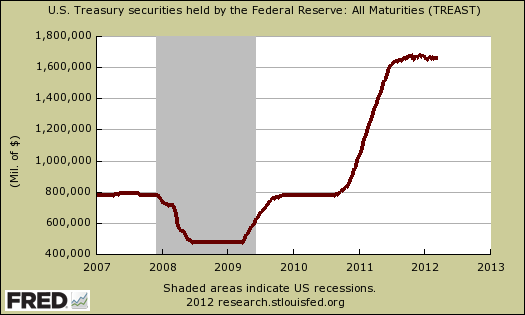 Below is the graph of the Federal Reserve U.S. Treasuries holdings. Total Reserve Bank assets as of December 31, 2011, were $2.919 trillion, which represents an increase of $491 billion from the previous year. Holdings of U.S. Treasury securities increased by $683 billion, GSE debt securities holdings decreased by $45 billion, and federal agency and GSE MBS holdings decreased by $156 billion. The balances held under central bank liquidity swap arrangements increased by $99.7 billion. 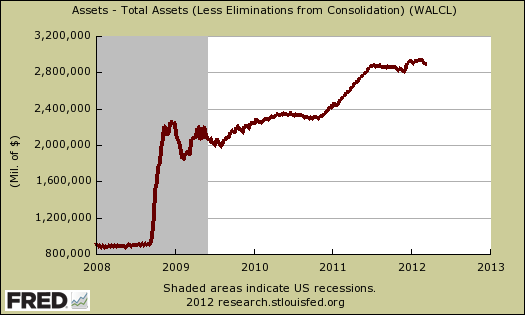 Graphed above are the total assets held as reported by the Federal Reserve press release. That's one frightening asset line, the sudden blast to the sky and now the ongoing high levels all the way to March 2012. How exactly does the Federal Reserve make money by buying from the government, then selling to the government? If it seems like profits are coming out of thin air that because basically they are. The profits are actually the result of quantitative easing as well as operation twist. Earlier we called this the great financial circle jerk. Astounding where interest on worthlessness assets can really pay out. Yet, when one deals the cards and also sits at the great derivative gambling casino table, the game is clearly rigged. How can one lose buying up U.S. Treasuries from money one prints? To wit, fictional profits and high risk are back in vogue. Remember those AIG CDOs at the center of the financial crisis? It seems big banks want to buy them from the New York Fed. The $47 billion face value in assets, held by the Federal Reserve Bank of New York, are the same kinds of financial instruments that … caused record losses across the financial industry. Plunging values of the securities, called collateralized debt obligations, or CDOs, caused AIG’s near collapse and a government rescue in 2008. The $182 billion bailout was widely criticized because a chunk of taxpayer aid was funneled through AIG to large banks. For example, if you paid $50 for a bond with a face value of $100 that pay 8% interest, you would receive $8 per year in interest payments, which is equivalent to receiving 16% of your investment back each year. If $24 of the initial $100 in bond principal is repaid, then over a three year period you would receive $48 of your $50 investment. These figures are roughly analogous to where the Fed stands with the AIG CDOs. This sizable cash flow is also what is attracting banks to these assets. There are few, if any, securities available that have the potential to generate so much current income at such a low price. So how do worthless CDOs manage to payout 8%? That question, on how these things manage to pay principle and interest is at best assumed because they were so originally overvalued. Yet considering their structure and what the CDOs are stuffed with, we find their profitability still hard to believe. Below is Seeking Alpha's explanation of AIG CDOs current evaluations and payouts. When the value of the CDOs dropped due to the rise in mortgage default losses and uncertainty about who was likely to bear the losses, these banks demanded collateral from AIG like Treasuries and high-grade corporate securities. As AIG’s credit rating fell, it had to post more collateral and eventually ran out of eligible securities. Absent intervention, AIG would have filed for bankruptcy at this point and the value of the financial guarantees it provided on the CDOs would have collapsed. Instead, the Fed rescued AIG with a loan and later spent $25 billion to purchase all of the CDOs from the banks at par (100% of their original value). According to the WSJ, the current market value of the CDO portfolio is just 37 cents on the dollar. This means that an investor could buy the entire $47 billion portfolio for just over $17 billion. (The original principal balance of the CDOs was $62 billion. In addition to the $25 billion payment from the Fed the banks were allowed to keep the $35 billion in collateral previously pledged by AIG. The remaining sum was provided by AIG to complete the transaction.) Despite dropping in price since the original bailout (the CDOs were valued then at 50 cents on the dollar), the Fed is unlikely to suffer losses because of the size of the interest and principal payments made since 2008. The closing of the American International Group, Inc. (AIG) recapitalization plan in January 2011 resulted in asset reductions of $47 billion, inclusive of the full repayment of the revolving line of credit with AIG in the amount of $20.6 billion and the redemption or sale of the Federal Reserve Bank of New York's (FRBNY) preferred interests in two AIG-related LLCs in the amount of $26.4 billion. The $47 billion worth of CDOs the banks want now are the toxic assets of the financial crisis. Yes, those toxic assets the New York Fed acquired, which were a glorified AIG bail out, are what the banks want now, as profits for themselves. What was that about privatize the profits, socialize the risk? In con artistry parlance, they call this the "reload." That's when you hit the same mark twice – typically with a second scam designed to "fix" the damage caused by the first scam. Someone robs your house, then comes by the next day and sells you a fancy alarm system, that's the reload. In this case, banks pumped up the real estate market by creating huge volumes of subprime loans, then dumped a lot of them on, among others, Fannie and Freddie, the ever-ready enthusiastic state customer. Now the loans have crashed in value, yet the GSEs (Government Sponsored Enterprises) are still out there feeding the banks money through two continuous bailouts. One, they continue to buy mortgages from the big banks (until recently, even from Bank of America, whom the GSEs were already suing for sales of toxic MBS), giving the banks a permanent market for home loans. And secondly, they conduct these quiet bulk sales of mortgages, in which huge packets of home loans are sold to banks at a "big discount." By now we've come full circle. Banks create the loans, make money selling them off on the market at high prices, then come back and buy them again when they're low. When the GSEs are in the middle of this transaction, it makes mortgage lending a basically risk-free proposition: Banks get paid for creating home loans and they end up owning valuable property on the cheap, but in between, they offshore the market risk to a government entity and/or to the idiot individual who bought the home mortgage in the first place. Does this ever end? Banks have become so powerful, so massive, it is to the point they are allowed to do just about anything. Go ahead, sell hyped out rigged mortgages, bundle them up and make profits on them, make more profits still when it is discovered the original mortgages are worthless, foreclose on the poor schmucks who were lent the original risky mortgages in the first place, acquire these same crab shack properties only to rent them out to people who lost everything in foreclosure and bankruptcy. The same predatory financial behemoths are now to become America's landlord. Next assuredly it will be out in the cold for you little match girl. These events are like watching thieves pick from the pockets of the dead. Nothing changes, nothing is stopped and America seems to be viewed as financial institutions' sucker pool. "The frankly own the place." * * * * * Excellent coverage of FED activity! Gold bugs -- including the honorable and redoubtable Jesse of Jesse's Café Américain -- are becoming a little more celeb culturalist than I like to see. I think it's their way of pointing out in more dramatic manner what Robert Oak says in plain old English. Banks have become so powerful, so massive, it is to the point they are allowed to do just about anything. "Blythe Masters [aka 'Queen Blythe'] who runs JPMorgan's commodities division, has steered the department to record turnover exceeding $2.8bn (£1.8bn) 2011 .... "
Someone at ChrisMartenson forums has somehow calculated that 'Queen Blythe' -- using an "unlimited digital line of FR credit" (hrh supposedly has the solid support of JPM's CEO, Jamie Dimon) -- routinely trades the total amount of physical silver available for investment, 890 times over each day. BTW: About 'unlimited digital line of FR credit'. Check out this little-known provision of the American Monetary Act -- YES, it provides for elimination of FR (i.e., fractional reserve) banking! What a concept! To me is perfectly fine and aok. So is not being on the gold standard, which has significant problems with physical supply, way too slow for modern finance (for 1). That said, the entire idea of buying Treasuries and returning the interest to the Treasury just seems like fictional money, to the point where is the reference, the standard, where's the "real" profits vs. the "made up" ones. This isn't to say I don't technical understand what's going on here, but it still just spooks me out. I'm just referring to the QE, Op. twist w.r.t. U.S. Treasuries in this statement, the CDOs, MBSes are another story. The way things are going ... it really does spook many sane minds. It's been pointed out here at EP that there is a problem with governments lacking responsibility about money creation. That's obviously a valid concern. The idea of the Federal Reserve (as I understand it) was to maintain a balance on the Open Market Committee, etc., between public members and members representing the supposed probity of the banking community. Unfortunately, the whole thing has gone whacko -- thanks to political corruption, which has resulted in the balance of power going over to major international banks, exceeding any government in disregard for monetary probity. Now enter the goldbugs with their absolute certainty that hyperinflation preceded by another stock market crash are just around the corner (before the end of 2012) ... and that the gold standard is THE answer to all of the problems. Also, the gold standard is inevitable or -- to borrow a word so beloved by the Marxists of old -- "ineluctable." Recent post at ZeroHedge by Antal Fekete in "Antal Fekete Responds to Ben Bernanke on the Gold Standard" exemplifies the nonsense that these people represent as gospel truth. Fekete begins by quoting Ludwig v. Mises that “the gold standard did not fail: governments deliberately sabotaged it, and still go on sabotaging it." The thing is that it is equally true that no fiat money has ever failed except that governments (central banks) have deliberately sabotaged fiat currencies, and go on sabotaging them! The gold standard is a gimmick, promising everything with just one simplistic reform. Marx, too, presented one simplistic reform, essentially a gimmick .... and the end result was the most disastrous concentration of power in the history of the world. Fekete's argument confuses the two opposing roles of "money" -- namely, store of value and medium of exchange. These two must meet somewhere in the middle, and that's called "measure of worth." But the truth is that money in the sense of currency or medium of exchange need not be an eternal store of value -- and if we try to make money into such a thing, we destroy the economy. On the other hand, currency must be able to function as a measure of worth. If that function fails, that too destroys the economy. The either/or approach to the question of the gold standard is ridiculous. Fekete's analysis leads to the conclusion that the gold standard is the solution to economic disaster ... only if we can accept the premise that there are only two choices: a rigid gold standard or absolute fiat. That premise is equivalent to that we must either accept Bernanke or von Mises, as though our ability to think terminated with those two voices. The problem is that the gold standard requires the same probity that must underlie any monetary system. Just because someone says there is gold behind whatever the currency may be ... what does that prove? Gold in the national treasury is a result or symptom of fiscal probity, not an efficient cause or sufficient guarantee of it. The same forces that conspire to destroy a fiat currency can (and surely would) conspire to destroy what would still be an essentially fiat currency, even if supposedly based on a gold standard. To coin Money, regulate the Value thereof, and of foreign Coin." Congress can coin money in any way it sees fit. Congress has the Constitutional authority to coin money in any metal it may choose (e.g., aluminum). And, just as with the Silver Certificates so common 60 and more years ago, Congress can authorize Treasury to issue certificates representing coinage. Furthermore, Congress has the Constitutional authority to regulate the value of coin (and, by reference, the value of all certificates and therefore of all electronic credits). Furthermore, Congress has the power to peg the dollar to any foreign currency, as it may deem expedient. Having said that, I hasten to add that I do not support continuing the Federal Reserve system (at least not as presently constituted). I do think that the basket of commodities approach is solid ... and probably the wave of the future. Gold is a great store of value, but the "gold standard" is a hoax and a pernicious delusional system. The Fekete ('Real Bills doctrine') school would say, not without justification, that they do not confuse 'store of value' with 'medium of exchange' functions at all -- but that their theory reconciles the two (as no other theory or approach to policy, supposedly, can). I just don't buy into Fekete's ideas about uniqueness of gold (some elements are more unique than others?) and about necessity for gold (over and above any commodity basket) -- and I'm skeptical of the entire Real Bills doctrine, at least when tied to the gold standard. Also, Fekete quite simply does (IMHO) misrepresent the monetary provisions of the U.S. Constitution. Did TARP "save the world"? Zerohedge reposting a CNBC video of Santelli going off about the claim TARP saved the world, with commentary, post is here. CBO estimates TARP will cost $61 billion this year (fiscal 2012) AND banks are paying back money through "free" money via playing Treasuries and quantitative easing. See, that way the books always balance? Many are up in arms about how regular, safe savings pays nothing, that was another aspect, investors being "primed" to get into high risk investments in order to obtain any return. That's us, folks. Negative real interest rates for America's savers at the local banks. These are the same institutions that will charge you usurious rates on credit card balances. You gotta love the Fed! If only they would refinance my mortgage instead of my having to borrow at 2 percent above the 10 year treasury and pay "fees" to banks for the "privilege" of refinancing. I brought this point up to a lender who currently has my mortgage (actually, Fannie Mae has it, so the bank has no risk) and they explained to me how the bank has to make a profit and then Fannie Mae also has to make a profit. I have never heard a satisfactory explanation of why the "vig" on a GSE carry trade has to be so high if the USG can borrow for 10 years at half the rate. What am I missing here on GSE w.r.t. the carry trade, link, reference, etc.? no QE is raining down on anyone to wash the stink away. I'm thinking that 'GSE' (government sponsored entity) here just means Fannie Mae and a 'carry trade' is a rollover. Frank T., was that a real person? Sorry. I didn't understand you ... For example, you could say, "I want to give the bank some money." AI ... final solution to the outsourcing problem?